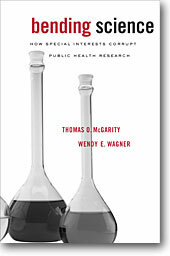 Thomas McGarity and Wendy Wagner won the $10,000 grand prize at the Hamilton Book Awards for their book, “Bending Science: How Special Interests Corrupt Public Health Research” on Oct. 28 at the Four Seasons Hotel in Austin. McGarity is the Joe R. & Teresa Lozano Long Endowed Chair in Administrative Law, and Wagner, is the Joe A. Worsham Centennial Professor in Law at The University of Texas at Austin. Their book was published by Harvard University Press. The awards are the highest honor of literary achievement given to published authors at The University of Texas at Austin. They are sponsored by the University Co-operative Society. Michael Granof, chairperson of the Co-operative Society, hosted the event and announced the winners. Victoria Rodriguez, vice provost and dean of Graduate Studies at The University of Texas at Austin, presented the awards. • Jacqueline Jones, the Walter Prescott Webb Chair in History and Ideas and Mastin Gentry White Professor in Southern History, “Saving Savannah: The City and the Civil War” (A. A. Knopf, 2008). • Peter MacNeilage, professor of psychology, “The Origin of Speech” (Oxford University Press, 2008). • Tracie Matysik, associate professor of history, “Reforming the Moral Subject: Ethics and Sexuality in Central Europe, 1890-1930” (Cornell University Press, 2009). • Karen Rascati, the Stewart Turley/Eckerd Corporation Centennial Endowed Professor in Pharmacy, “Essentials of Pharmacoeconomics” (Lippincott Williams and Wilkins, 2008). The University Co-op is a not-for-profit corporation owned by the students, faculty and staff of The University of Texas at Austin. Since the year 2000, the University Co-op has given more than $28 million in gifts and rebates. Three years ago, The New York Times tapped the expertise of regulatory law expert Thomas McGarity, professor in the School of Law at UT, for a story about the Bush Administration’s quiet strategy to limit lawsuits against product manufacturers by asserting the power of federal regulatory agencies. The story eventually led McGarity to write “The Preemption War: When Federal Bureaucracies Trump Local Juries” (Yale University Press, 2008) about the decade-long preemption war in the courts, federal agencies and Congress—an issue he’d worked on as a member scholar of the Center for Progressive Reform. While many people are unaware of the preemption war, the outcomes of these court battles will affect everyone, and consumers stand to be the biggest losers, McGarity says. McGarity recently sat down to talk about his latest book, which hits bookstores on Dec. 2, as well as a high-profile preemption case currently pending at the U.S. Supreme Court. In a nutshell, what is the main claim that you make in the book and why? The overall thrust of the book is that in our federal system, Congress and the courts should be very cautious about preempting common law claims. State and federal laws and regulations typically provide “protective justice.” They are meant to deter specific conduct. The common law, on the other hand, provides “corrective justice,” a term that refers to the common law’s goal of forcing wrongdoers to compensate their victims. Since federal law rarely provides corrective justice, federal preemption of common law claims means that deserving victims will not be compensated. In my view, this is usually an unjust outcome. You discuss many court cases in your book. Which one is going to have the most impact on consumers, depending on how the cases are decided? The recent case with the greatest potential impact is Wyeth v. Levine, a case that the Supreme Court heard in early November. In that case, the question is whether approval of a drug label by the federal Food and Drug Administration impliedly preempts failure to warn claims at state common law. A broad holding by the Supreme Court will effectively throw out the vast majority of claims by patients injured by drugs because the drug company neglected to warn them and their doctors about adverse side effects. The Supreme Court has on many cases stated that there is a presumption against preemption, but that presumption is often ignored in practice. One of my suggestions is that we take that presumption seriously. I hope the Supreme Court takes my advice. In your book, you provide numerous examples and stories of particular battles in the preemption war. Could you describe one for us? One of the most troublesome examples in the book is the case of Buddy Kuhl, a Kansas City resident whose primary care physician recommended that he see a heart specialist after he suffered a serious heart attack. Two different specialists recommended that Kuhl undergo heart surgery at a St. Louis hospital, but his medical benefit plan’s “utilization reviewer” refused to approve his pre-certification request. Because he could not afford to pay for the operation out of his own pocket, the surgery was canceled. After a third specialist agreed that surgery in St. Louis was necessary, the plan finally did pre-certify the operation. But Kuhl’s heart had deteriorated by then to the point at which surgery was no longer a feasible option. When the specialist recommended a heart transplant instead, the plan refused to pre-certify that surgery as well. Kuhl died three months later. His family sued the medical benefit plan for botching the job so badly, but a federal court held that the claim was preempted. (See Kuhl v. Lincoln National Health Plan of Kansas City Inc., 999 F.2d 298 (8th Cir. 1993)). What do you hope readers will learn from your book? First, I hope the general reader will take away an understanding of how federal preemption works and the unique status of state common law in the context of preemption. Second, I would like the reader to appreciate how very important these issues are to all of us who purchase products and services in a vigorous national economy. None of us knows when he or she might be injured by some defective product or negligent practice, and all of us expect justice when that happens. We need to be aware of how federal agency preemption of state common law undermines this expectation. Professors and alumni from The University of Texas at Austin will share their expertise on topics ranging from the U.S. economic crisis to political figures in American history at the 2008 Texas Book Festival Nov. 1-2 at the Texas Capitol. When: Sunday, Nov. 2, 2-2:45 p.m. When: Saturday, Nov. 1, 12:30-1:30 p.m.
Former Texas Gov. Dolph Briscoe tapped Don Carleton’s narrative writing expertise to author his memoir, highlighting his life and career in Texas politics. Briscoe describes his days as Texas’ largest individual landowner and cattle rancher, his years in public office and his education at The University of Texas at Austin. Carleton has collaborated on books with Walter Cronkite and Waco Entrepreneur Bernard Rapoport. When: Sunday, Nov. 2, 12:30-1:15 p.m.
James Galbraith’s compelling, timely work covers hot-button issues, such as the free-market economy, the subprime crisis, economic and social disparities and the future of the dollar. The expert economist dissects conservative economics and conventional liberalism, stimulating debate across party lines about the mistakes made within the U.S. economy. Galbraith is author of six books and contributes to the American political magazines, including Mother Jones, The American Prospect, The Nation, The Texas Observer, as well as op-ed pages of major newspapers. When: Sunday, Nov. 2, 3-3:45 p.m. The Texas Book Festival was founded in 1995 by former first lady Laura Bush to promote reading and honor Texas authors. Sessions are free and open to the public. Proceeds from books purchased at the festival benefit the state’s public libraries. ShelfLife@Texas is a space for book lovers to discuss literary news and events at The University of Texas at Austin. We interview writers and report on books by faculty, staff, students and alumni of the university.